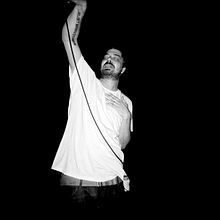 Syosset, Oyster Bay, New York, U.S.
Ian Mathias Bavitz (born June 5, 1976), better known as Aesop Rock, is an American hip hop artist and music producer who lives in San Francisco, California. He was born in New York. ↑ "Kimya Dawson – "Miami Advice" Feat. Aesop Rock and the Olympia Free Choir". SomeKindofAwesome.com. Retrieved November 2, 2011. This page was last changed on 10 August 2017, at 20:32.